An Intimate Evening of MAGIC, MYSTERY and OOOH LA LA! STEP RIGHT UP and get ready to Laugh, Have Fun, and Celebrate a magical night out with Carnival of Illusion! This top-rated attraction is "Revitalizing Magic" by blending their international theme with all the charms of a Vaudeville-inspired roadshow. Join the thousands of guests who celebrated magical Date-Nights, Anniversaries, Holidays, and Special Nights Out. 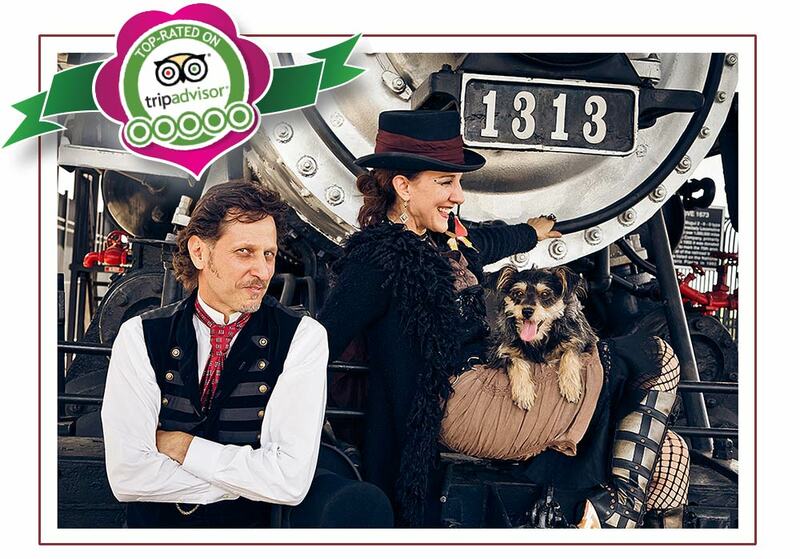 Called the "Best Show in Tucson", this is a Must-See for tourists and armchair travelers alike. Carnival of Illusion is Magic, Mystery, and OOOH La La! Due to the popularity and intimate nature of this boutique theater, Shows SELL OUT in advance. Book your seats early. It's more than a GREAT Magical Theater Show. Tucson’s premiere venue for art and independent films. This Tucson favorite art house is host to several film festivals throughout the year as well as film discussions with the artists. Documentaries, foreign films and cult classics are also part of the bill. Each month they also hold a short film contest. So grab yourself a beer and a slice of pizza at the concession stand and settle in for a movie. Historic hotel and nightclub in downtown Tucson with live music. Enjoy a drink outside on the patio on a warm summer night, or head inside to the lobby lounge or club bar. The Cup Cafe is also a hip spot for an upscale dinner and/or dessert. Famous for being the place where the gangster John Dillinger was brought to justice, this hotel has lots of ghosts and stories to boot. The University campus hosts international performing artists. You will want to check each seasons offerings for greats in music, comedy and dance. Past artists have included the Kodo Drummer's of Japan, Tony Bennet and the Twyla Tharpe dance company. They also offer discounts at the beginning of each season for show packages. This once small motel, turned restaurant, bar, music hot-spot, is a lovely outdoor venue. Even in the summer, during our summer heat, it is a fun spot at night, since they have misters to keep everything cool. The food is good too. I've seen some great music here and most nights are free. Tucson landmark of the legendary painter Ted DeGrazia. This artist became famous for his paintings of children of the Southwest, after doing a Unicef card that was sent to millions. He also was a ceramic artist. His Gallery of the Sun is a wonderfully preserved example of old-time Southwest living and expression. Visit the gallery for a feel for the life of a real Southwest artist. The oldest active Catholic mission on the Tohono O'odham reservation. The mission church was completed in 1797, but the mission itself was established in 1692 by Father Eusebio Kino. At one point the mission was part of Mexico until 1854 when it joined the United States as part of the Gadsden Purchase. The mission is free to all visitors and over 200,000 people each year come to see this example of Spanish Colonial architecture. A downtown museum dedicated to the railroad history of Tucson. Locomotive #1673, which was built in 1900, is displayed on the premises. Each year the museum is host to the Silver Spike Festival which celebrates the first trains coming to Tucson in the late 1800s. An 1870's love triangle ended in murder and is now the site of a shrine. This soap opera-like tale focuses on the death of an adulterous young man who was in love with his mother-in-law. The tale ends in tragedy for all, and the young ranch hand was buried on the site of the shrine, where he was brutally murdered by his father-in-law. People visit the shrine hoping for help with their love lives and their broken hearts. The cities first neighborhoods (or barrios), date back as far as the 1860s. These barrios are predominantly located in central Tucson and make for a fun walking tour. Structure styles include Sonoran Row Houses, Mission Revival, bungalow style and American Territorial Adobes. One of the striking features of these styles are the long rows of buildings that are not set back from the street, creating a striking visual line of continuous housing. Tucson's oldest neighborhood is the El Presidio neighborhood, which has its own appeal as being the location of the Tucson Museum of Art and many lovely restaurants and shops. One of Tucson's best Italian restaurants, this fine dining establishment is for those special occasions or for those with a little more green in their pockets. Their upscale location and consistent food and service keep people coming back. They specialize in Northern Italian cuisine. The three locations of El Guero Canelo serve Sonoran style hot dogs in a family outdoor Mexican experience. This popular local restaurant recently received the James Beard American Classics Award for its dogs. A Sonoran dog is a bacon wrapped treat smothered in tomato, onions, beans, mayonnaise, mustard, and jalapeno. All presented in a super fluffy bun. Yum! The chef and owner Suzana Davila brings the freshest and most distinctive flavors of her home in Sonora Mexico to her celebrated restaurant. 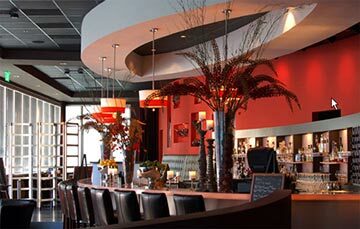 Featured in some of the top food and news magazines, Cafe Poca Cosa is considered the best Mexican restaurant in town. Downtown, upscale, modern and slightly urban, this is definitely not your typical Mexican food restaurant. Fine Italian dining with a casual and comfy atmosphere. Chef Massimo Tenino was born and raised in Italy and brings the recipes and flavors of his mother and grandmother's cooking to Tucson. There is an extensive wine list and also a salumeria (meat market) where you can buy authentic Italian cured meats. And yes, there is a wood-burning pizza oven! Don't be creative and try other locations with the same name in town. They are NOT the same owners and nowhere near as meticulous with their food.) This place is wonderfully tacky with a great old-school vibe and the food is fabulous. There's even outdoor seating to enjoy the Tucson weather with a margarita (or two) in hand. Try the ceviche or culiche on filete, our favorites, and ask for a song from the strolling musicians that might drive by. Spanish can be helpful but not necessary! Another outdoor restaurant venue, this lovely courtyard in the old El Presidio Neighborhood (see Barrios above), has an incredible ambiance. The music is always free and you can come for dinner, snacks, just a drink or merely come for the music.! This espresso bar and cafe have a lot to offer. Not only do they serve coffee, but other fun drinks like real creme soda and Italian soda. 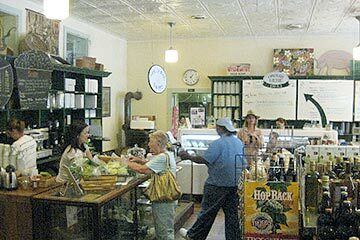 There's freshly made sandwiches, salads, and desserts including scones made from scratch daily. Located on Tucson's fun 4th Avenue. Raging Sage is all about the coffee, especially sustainable, bought and roasted in small batches coffee. This small but popular spot doesn't have a huge amount of places to sit but does boast a nice little tree shaded patio. They focus on good coffee and it shows. A neighborhood market that is a mix of everything: groceries, deli, pizza, and beer. Their selection of gourmet chocolate bars is unique and their pizza is a favorite of many locals. Sit inside next to the eclectic aisles of groceries or outside on their shaded patio. A trip to Trader Joe's on Campbell can be complemented with a quick cup of espresso at Caffe Luce, or if you are hanging around the UofA, they have a second location on University Ave. This Caffe is a place for coffee and maybe a dessert. A good place to stop and chat with a friend over a cup of Joe. Village Bakehouse is one of our best local bakeries with relaxing Sunday breakfasts outdoors. You can also order cakes here for any occasion. Special orders welcome for those with allergies. They are open nice and early at 7 am for that pastry and coffee fix before work. Definitely the best sunset view in Tucson. When you reach the top of Gate's pass there is a pull-off that leads you to a parking lot. The look-out at sunset is very memorable. The pass itself used to be much more dangerous, but it was widened and improved in 2006. Fantastic first introduction to the Sonoran desert, there are actually two parks, one east, and one west. There are visitor centers at both parks, although the western visitor's center is a little more robust. You can watch a short film at either location that explains the Sonoran Desert from the viewpoint of the Native Americans from this region. Take a walk and enjoy the downtown panorama view. This bird's eye view of the city can also be reached by car. The winding road takes you around the small "mountain" and up about halfway to a viewing spot. The rest of the way can be hiked on foot if you feel like a short stroll through the desert. The view reaches from the far west side of the city to north, east, and southern views. Touristy, easy and beautiful walks of the desert, or take the tram. This canyon is a favorite with locals and tourists for its easy and beautiful hikes, with plenty of water features. Be forewarned that there is a cost to enter the park during daylight hours. People do however take the wide and safe trail up the canyon on moonlit nights either with or without a flashlight. 40,000 bats at sunset leaving under the bridge at the Rillito and Campbell. Living hidden under the bridge by day these small and helpful creatures rest all day, so that they can leave their beds at sunset and head out for nighttime dining. They eat insects and mosquitoes, which they are so helpful in ridding us of. After watching the bats, you can take a stroll along the Rillitto river, but remember it is getting dark so best to bring a flashlight if you plan to go far. Beautiful photography gallery and exhibits. The Etherton Gallery specializes in 19th and 20th-century photography as well as contemporary photography. They also highlight the art of local and regional artists working in several types of media. Modern images, great library, and amazing archives. This center is located on the campus of the University of Arizona and is also a research facility. It is one of the finest academic art museums for photography there is. A comprehensive look at local native cultures, with displays of pottery, basketry, and other anthropological artifacts. This research museum cares for more than 3 million objects and was opened in 1893, making it the oldest anthropology museum in the Southwest. Each year they host the Southwest Indian Art Fair which highlights the works of over 200 native artists of the region. The Amerind Foundation received its name by combining the words American and Indian, which is exactly what youâ€™ll find at the foundation. Originally, it was home to an amateur anthropologist and archaeologist in the stunningly beautiful Dragoon Mountains 60 minutes outside of Tucson. Now, the Amerind Foundation is a research center and museum focusing on the preservation and interpretation of Native American cultures and history. This is one of Tucson's best-kept secrets, so much so that most Tucsonans don't even know it exists. Housed in the basement of the Flandreau Science Center on the campus of the University of Arizona, this mineral museum holds some shockingly beautiful specimens. The wealth of minerals from underground is vast and the museum holds over 1,500 different species with over 2,000 specimens on display. The museum is open every day of the week and there is a reasonable fee to get in. If you've never seen what gold or silver looks like in its native form, have a fascination with the wonders of nature, or just want to get out of the sun for a while, then stop by this little known museum for a gander at some of nature's gems (and I really mean gems). Keeping the old world alive and sharing the magic of music. This shop has recently changed owners but still retains all the charm. Chock full of vintage and used equipment for sale with a few new items thrown in for good measure, you will find all kinds of instruments here. So if you are looking to buy, or have something to sell or put on consignment, then this is a great place to start. Local artsy gift store with a visit to Mexico feel. You will find folk art, fashions and furnishings, and that is just for a start. If skeletons are your thing, there are many Day of the Dead curious and cultural objects. Let the bright colors and bold designs of Mexico perk up your day without ever having to leave the country. Keepers of the native seeds and agricultural folklore. Native Seeds/Search focus on crop diversity to secure food supplies for the future. Along with seed banking and seed distribution, they also provide education and research. You can acquire local seeds through several different programs or go into their retail store for smaller amounts. Also on offer are gifts that focus on local products. Beautiful collections for sale of Native American jewelry. Shops and cafes and bookstores and strolling and more. 4th Avenue is the trendy, fun street where an easy afternoon can be spent strolling up and down visiting the many shops and curiosities. Small cafes and restaurants can be found all along the street, including many of Tucson's favorite pizza joints. Twice a year they host the 4th Avenue Street Fair when the street closes down and the whole city comes out to wander about, shop from hundreds of artisan vendors, and listen to music. Every single weekend in Tucson you can buy or sell at the Tanque Verde Swap Meet. With 19 acres of selling space, there is a huge variety of stuff for sale at the swap meet. You never really know what you are going to find, both old and new. It's also a fun place to take the family with rides for the kids, and if you are hungry there's lots of food vendors, a cafeteria, a grill, and a snack bar. You can go on Friday, Saturday, and Sunday, open until 11 pm on Fri. and Sat. You'll find a farmer's market in Tucson every single day of the week. Some are more central, and some are found on the outskirts of town. Big or small, they all offer a variety of local produce, food products, and craft goods. Some even offer services such as knife sharpening. If you are not sure which one is the best to visit, ask a local. They are sure to be able to tell you their favorite-Sundays at St. Phillips Plaza perhaps or maybe the Santa Cruz River Farmer's Market on Thursdays. Tattoos, rockabilly, shufflepuck, and ambiance with attitude. Historic bar, restaurant & Wild West murder in the old barrio. Strong and cheap, past its heyday but still funky. No more gogo girls. Created by Indiana native George Phar Legler, this imagination wonderland for children was inspired by George's kindness, gentleness and life's desire to help people. He wanted to bring health and well-being to children and others through imagination. He built this strange jumble of imaginative grottoes as a background for his storytelling and belief in fairies. It is now open to the public only two days a month. This iconic lumberjack was put up in 1964 so Leo Toia's customers could find his hot rod auto parts store. This Paul Bunyan figure has stood the test of time and been dressed up as Santa, been made to look like a member of ZZ Top and has sometimes been seen to hold the American flag instead of his trusty ax. He was lovingly repainted in 2012 and will possibly be standing long after we are all gone! A giant fiberglass icon in Tucson outside a popular Mexican restaurant. Built by a local artist in the early 1960s, it was put there because the owner of the restaurant loved bullfighting and ranching. The bull's larger than life private parts are often painted by pranksters. This 16-inch telescope located next to the Flandreau Science Center is run by volunteers, so call first to check and see if it will be open. Hours generally run Thursday through Saturday from 7 pm to 10 pm. The volunteers are happy to answer questions about the night sky. This plaza style park has been in use as a park area as far back as 1776. It currently lies in the area between the City Hall and the Old County Courthouse. There is a central fountain, a small rose garden dedicated to John F. Kennedy and several public art pieces. This area is often used for public festivals such as Tucson Meet Yourself and the Tucson Folk Festival (see our festival section). One of the things one always struggles with when they arrive in a new town is what to tune in to on the radio. One of our favorite stations in Tucson is community-based KXCI radio. With a surprising range of musical genres and weekly â€œshowsâ€, there's always something interesting being served up on KXCI. You won't find your typical demographically oriented station that is influenced by market concerns. Here you will also be able to hear local information about upcoming events, musical and otherwise. Not a museum but a living outdoor park with animals. Think modern zoo. This is one of Tucson's all-time favorite visitor spots and is the go-to place to take friends who know nothing about the Sonoran Desert. Well appointed trails lead amongst native plants and animal habitats. There is also a display that focuses on the geology of the area, another that teaches about the wetlands and a daily demonstration of raptors to name just a few of the many reasons to visit. An in town, outdoor desert experience with local art exhibits & tea house. This 49-acre botanical garden is devoted to desert plants and allows the visitor to leisurely walk amongst cactus and succulents to their heart's content. The tea house is a very popular spot for lunch, and there is also a lovely gift shop on the premises. Each year at a special time when the night blooming cereus cactus start to show off, you can visit the garden in the dark with your flashlight and catch this bizarre cactus flower in action. An easy to walk small zoo with lots of nice exhibits. Located in Reid Park, this small but fun zoo has all the usual characters: zebras, lions, elephants, and giraffes, just to name a few. There are also a few surprises like the dwarf screaming hairy armadillo and the bearded dragon. The perfect place for some family fun. Nice gardens and shade. Another of Tucson's treasures, this garden is host to Butterfly Magic each year between October and May. Walk into a special greenhouse filled to the brim with colorful butterflies feeding, flying and sometimes even landing on you. You might even catch sight of a bright little frog or two. Also on premise is a quaint cafe with the best eggs benedict in town. Funky museum with beautifully restored horse-drawn vehicles. Located at the Tucson Rodeo Parade grounds, this museum is only open from January through the first week of April. Professional theater in a gorgeous downtown location. Arizona Theater Company has been bringing top-notch theater to Tucson and Phoenix for half a century. Their performers, directors, costumes, and scenery are simply outstanding. Everything from classics to premieres to award-winning plays, you will find nothing but great theater here. The Proscenium Theatre is part of the Pima Community College Center for the Arts, which also includes a Black Box Theatre, a recital hall, and the Louis Carlos Bernal Gallery. The college's theatre arts program produces four productions each year, each targeting different aspects and skills of the theatre arts. If silliness and fun are what you need, then look no further than the Gaslight Theatre. It is a play, sing-a-long, pizza parlor all rolled into one, sort of. Enjoy beer, pizza, ice-cream and tons of free popcorn at your table while you cheer and boo along with the action. Music, laughter and good times abound and have been going strong at the Gaslight for over 35 years. Borderlands Theater focuses itself on exploring and highlighting the special cultural and community voices of the U.S. / Mexico border region. They place special emphasis on the Latino / Chicano / Mexicano voice. They produce both new plays and plays by established playwrights. The is theatre with a unique regional flavor. If you are looking for large-scale Broadway type productions like Mamma Mia!, The Lion King, Chicago, and Wicked, then look no further. Broadway in Tucson has been drawing the crowds since its debut season in 2004. It is part of the Nederlander Producing Company of America, who operate theaters in large cities across the country including New York, Chicago, and L.A. This is wonderful community theatre with local talent, a cozy theatre, and super affordable tickets. They produce a variety of shows that are shown on select weekends, with a matinee on Sunday. The Community Playhouse is home to The Community Players, but also is home to several other small non-profit local community theatre companies. October - Celebrating the diversity of Tucson, this three-day event highlights the ethnic mix of cultures in Tucson while showing off the arts and culinary expressions of each culture. With several stages and tons of food trucks, you will find yourself strolling the streets of downtown Tucson eating something delicious, and then catching a really great performance. The best part is it's free! February - This is one of the world's biggest gem and mineral shows. With more exhibitions than can possibly be visited during the two-week event, you will be overwhelmed and overjoyed at the vast quantities of gems, jewelry, fossils and more!! What started out as strictly a gem and mineral show, has grown to include vendors of other wares. But if it is a real crystal ball or a million-year-old fossil you are looking for, this is the place. March - Celebrate everything written on word, paper or book. The Festival of Books is held each year on the campus of the University of Arizona. With special readings by authors as well as book signings and such, this is a bookworms best day out. November - aka. Day of the Dead a la Tucson style. See it! This event culminates with a huge parade that honors the dead. With huge puppets, drum groups, dance groups, and hordes of people all decked out to resemble skeletons, this is not your typical parade. Fall - Hundreds of artists open their studios and homes all over the city for two weekends of Open Studio Tours. Talk with the artists and find out what makes them and their art tick. Purchase something new for the wall or that little nook that needed something special. Grab yourself a map of the event and pick an area. Some areas are dense with artists and you can stroll from one to another. Others are a drive to get to. There is certainly lots to inspire! May - Perfect weather and free music are always on the menu for the folk festival. Two days and five stages add up to a lot of great music and it doesn't cost a penny! This is a family-friendly event celebrating the American Folk music tradition in all its variations including Bluegrass, Country, Celtic, Latin and so much more. February - the largest non-motorized parade in the country, otherwise known as the La Fiesta de los Vaqueros. The first parade started in 1925 and has been a traditional part of the Tucson Rodeo ever since. A great day exploring, finding and not finding. If you enjoy getting in your vehicle for a good long drive into the middle of nowhere, then this is a great way to spend the day or even the weekend. Arizona is full of history, old mining towns, and long derelict outposts. A good off-road vehicle is recommended to reach many of the sites. A Greek Orthodox Catholic monastery. This is a functioning monastery where the monks practice daily ritual and prayer and also work that includes gardening, woodworking, and food preparation. You are welcome to visit as a day guest, but note that proper attire is required. St. Anthony's also accepts those on pilgrimage and retreat. The park helps to preserve the ruins of three historic Spanish colonial missions on 47 acres of land. There is a visitors center as well as a bookstore and museum at the park. Guided tours are available. There is also a small fee to enter the park. The oldest of the three missions is San Jose de Tumacacori, and it built on the site of a Pima Indian Village. It is also the best preserved. A beautiful drive out to Patagonia will reward you with the opportunity to eat at this fun little restaurant. This small town of under a thousand people is in an area known for its bird watching, cowboy culture, and nearby ghost towns. The Velvet Elvis is the best place to stop for some modern eats when visiting the area. This small town known for its mining history is now a retro artist village. Popular with tourists, it has a fabulous old hotel and lots of smaller inns and bed and breakfasts. The main street houses lots of fun shops, galleries, cafes, and restaurants. There are also daily tours of the old Copper Queen mine which was one of the biggest copper producing mines in Arizona for almost 100 years. Tacky and touristy but fun and unique. Tombstone is famous for its gunslinging history where the shootout at the OK Corral took place. Founded after silver was discovered in the area, it grew to be a sizeable town almost overnight, burning down and being rebuilt several times. Visit for the reenactments, the museums or the history. It's all about the old west in Tombstone Arizona. If what's in the sky is more appealing to you than what's underground, then there is Kitt Peak National Observatory. It â€œsupports the most diverse collection of astronomical observatories on Earth for nighttime optical and infrared astronomy and daytime study of the sunâ€. Yikes, what a mouthful. Needless to say, you can go there to observe what's happening out there in the universe beyond our planet. There are both daytime tours and also evening programs, which include nightly observing programs. This amazing limestone cave was discovered in 1974 but was kept a secret from anyone until 1978, and it became a state park in 1988. This is a living cave, meaning it is still growing! There is a lot of conservation and education being done in order to preserve this incredible underground habitat. Amazing stalactites and stalagmites (don't ask me which is which), grow up from the floor and down from the ceiling. The tour is about 1.5 hours and afterward you can visit the Discovery Center to learn everything there is to know about limestone caves. The only movie theater in town where you can order food and drink right from your seat. Showing all the latest movies, check it out on Tuesday nights when it is just $6 for a movie all day long. On occasion, you will find a screening of a classic movie. Community movies and home of the Arizona International Film Festival. This small downtown theater also hosts live music, open mic nights and screenings of old movies. Standing at the gateway to downtown Tucson, this more recent addition to Tucson makes for an interesting site. 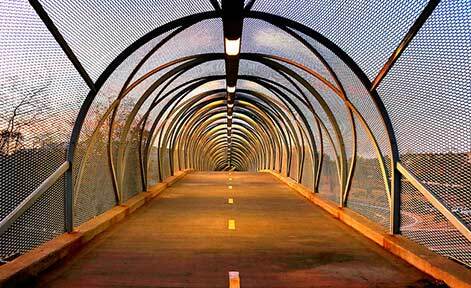 This is strictly a pedestrian and bicycle bridge. Walking between the fangs and along the "body" of the snake, you will notice that it does indeed rattle! In Tucson we celebrate these large venomous lizards. Did you know they only eat 5-10 times per year? They spend most of their time in burrows underground. If you really want to see one in the living flesh, visit the Sonoran Desert Museum (see listing above). Otherwise, these sculptures can be found in the median along Irvington bridge, just west of Mission. Cows, cows and more cow murals. Grant Rd. at I-10. The mural was painted by Australian-born artist Leslie Grimes in the 1960s. And if you happen to be looking for dinner theatre things to do in Tucson, our wonderful town, we have a list just for that! Please come and visit, have fun, and play!